Bring your holiday cheer and gather with family and friends to light up the night & welcome the season at Shops at Merrick Park! Donate a new, unwrapped toy to benefit and support a great cause for Nicklaus Children’s Hospital. Win a chance to win some prizes with every unwrapped toy donation, all winning tickets will be announced during event. Hosted by - Belkys Nerey WSVN Channel 7 News Anchor & Mayor Raul Valdex-Fauli, City of Coral Gables. Enjoy performances from UM Frost School of Music Carolers & Miami Royal Ballet and special guest appearances by Santa Claus! Enjoy a performance by the Miami Symphony Orchestra featuring two-time Tony Award Winner Bernadette Peters. The Miami Symphony Orchestra (MISO), now in its historic 28th season, is Miami’s hometown professional symphony and a valuable contributor to Miami’s cultural fabric. Led by MISO Music Director & Conductor Maestro Eduardo Marturet, the performance will include a special performance by 2x Tony Award winner and American musical theater icon Bernadette Peters. Tough Turkey in the Big City: A Thanksgiving Odyssey, by Bruce Adolphe and Louise Gikow and performed by the chamber ensemble of Orchestra Miami. Follow the adventures of Tom Turkey as he leaves the farm to travel to the Big City! 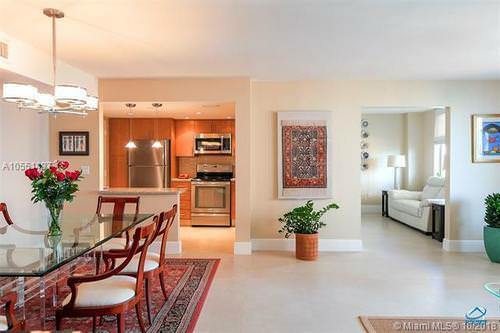 Elegant and quiet unit with beautiful views in the heart of Coral Gables.